It’s not actually my first time at the Rhode House. In fact, it’s probably the place I go most often in the emporium. So, I decided to take another look at it, to see whether it’s worth your time to order a calzone from the Rhode House next weekend. The restaurant’s front window is covered in neon signs, and sports décor covers most of the only wall not taken up by kitchen space. The floors are a strange mix of blue and yellow-colored tiles, but the whole place looks like it’s been redone recently. On a Tuesday night, before a school vacation, it was pretty much completely empty. But on the weekend, the tiny space gets very crowded, leaving not even a single open seat and about an hour wait for delivery. There are a decent number of options on the menu, including salads, chicken wings, a selection of appetizers, paninis and bowls, but of course the main items are calzones and stromboli (as you might tell from the flashing neon sign in the window). Just like I-Zone and other restaurants in the emporium, the menu has its fair share of ridiculous items, like the Fried Frenzy calzone, which has chicken fingers, onion rings, mozzarella sticks and fries. The selection of more standard options is extremely comprehensive, with everything from simple pepperoni and cheese, to meat or vegetable based options. I chose, for the sake of comparison, to go for another chicken parmesan calzone, which was around $9 and change, plus a drink, for a total of just over $11. I skipped the appetizers, because I almost never see them ordered, and I wasn’t interested in a repeat of the last time I ordered mozzarella sticks at a calzone restaurant. The calzone was huge, likely the size of half a pizza, and the edges of the crust might have been mistaken for pizza crust. Inside the crust was chicken, a marinara sauce, and a blend of ricotta and mozzarella cheeses. Unfortunately, the dough was sort of bready at times, and seemed a little unevenly cooked. The chicken was also a little rubbery, but thankfully the cheese and sauce made up for them. The ricotta wasn’t overpowering, and both cheeses were pretty equally present, which was nice. Shockingly enough, the sauce seemed to be actually seasoned, which was a welcomed change. As with most late-night junk food, the first bite was the best. The best part of the calzone was the two inner pieces, with the overly thick crust out of the way, which is too bad, because I do not advise eating an entire calzone from here in one sitting — even though I always do. A small could feed up to two people, if you’re not too hungry, and a large is definitely enough for two or three. In total, I would say that the calzone I had at the Rhode House is pretty much the same thing as the I-Zone calzone in terms of actual food quality. The building seemed clean and well-kept, and the service is always very friendly, which is where I think it begins to edge out the other option for calzones in the emporium. 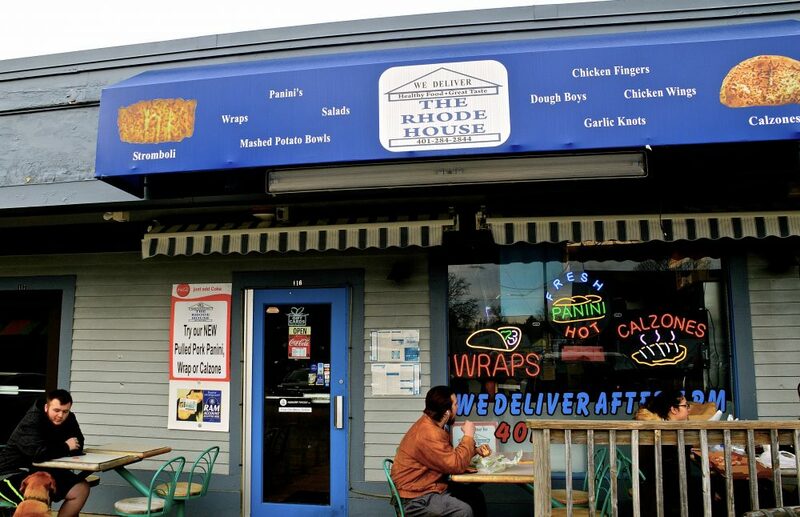 Especially if you’re looking for a lot of crust, it’s hard to go wrong with Rhode House.